Image caption A man holds a placard at the protest reading, "Samir didn't die, the government killed him"
The protesters held signs saying "Samir didn't die, the government killed him"; "Samir lives"; and "Justice for Samir". His death came just days before Saturday and Sunday's public referendum on the plants. 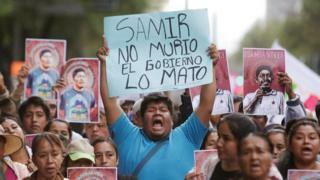 Image caption Protesters in Mexico City carried placards reading, "Samir lives"
Mexican president Andres Manuel Lopez Obrador expressed regret about the killing but said the referendum would go ahead. "I'm very sorry about the murder," he said. "The consultation we have to continue because it is a process that was already agreed to." Flores's family and friends were joined by many others in Amilcingo on Friday for a funeral procession through the streets. The procession paused at the offices of Amiltzinko Community Radio, where Flores worked as a producer. The contents of a note found next to Flores's body were not disclosed by police. An environmental group he worked with said it believe the murder was linked to his opposition to the pipeline. Officials said that they had no evidence that Flores' killing was linked to the project or the referendum. Morelos state prosecutor Uriel Carmona told Radio Fórmula that he believed the murder was connected to organised crime.